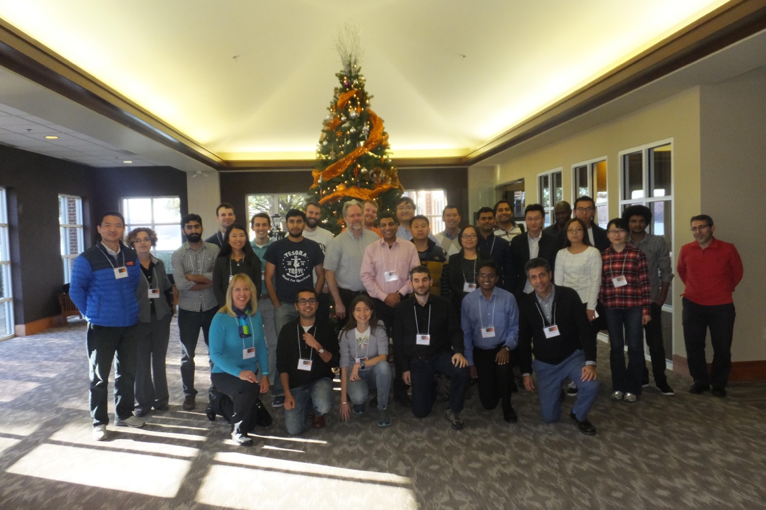 December saw two GENI events: GENI NICE 2016 co-located with CoNEXT 2016 in Irvine California and a GENI Regional Workshop (GRW) at Clemson University. GENI NICE (Network Innovators Community Event) is a premier event for researchers and educators to demonstrate, present research results and discuss works in progress related to GENI. GENI Regional Workshops deliver a focused introduction to GENI, using lectures and hands-on tutorials, that new users find most helpful to begin using GENI effectively in their work. All sessions were proposed and organized by community members. GENI community members responded to a “Call for Sessions” and organized sessions they proposed. 24 community members responded to a “Call for Demos and Posters” and presented their work at a combined NICE demo session/CoNEXT welcome reception. Many of them stayed on to present their work at the CoNEXT poster session the following day. The CoNEXT Student Workshop participants also presented posters at the NICE demo session. GENI NICE and two other co-located workshops—Cloud Assisted Network (CAN) and CoNEXT Student Workshop—came together for a lively panel on “What’s the Right Testbed for your Experiment” organized by Michael Zink of the University of Massachusetts and Murat Yuksel of the University of Central Florida. 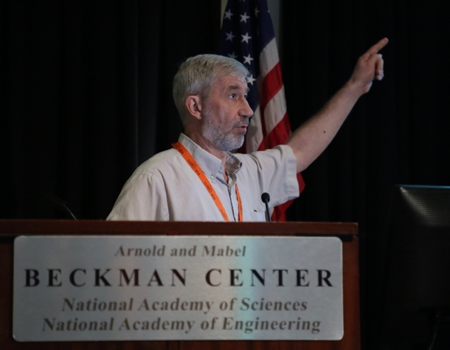 A keynote by Jack Brassil of the NSF on Platforms for Advanced Wireless Research (PAWR) and its relationship to existing and future research infrastructures. Prof. Peter Steenkiste of CMU discusses testbed-based evaluation of the eXpressive Internet Architecture (XIA) in the Non-IP Experiments over GENI session. 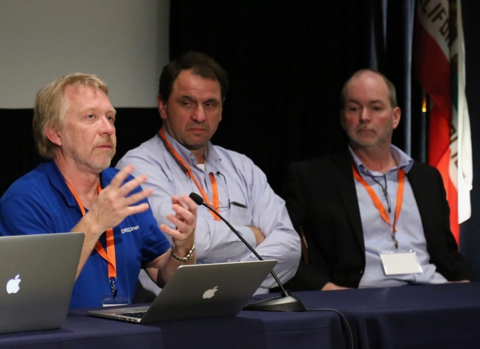 Ivan Seskar (Rutgers) and Jack Brassil (NSF) listen as Jerry Sobieski of NORDUnet describes the GÉANT Testbed Service (GTS) during the “What’s the right testbed for your experiment goals?” panel. 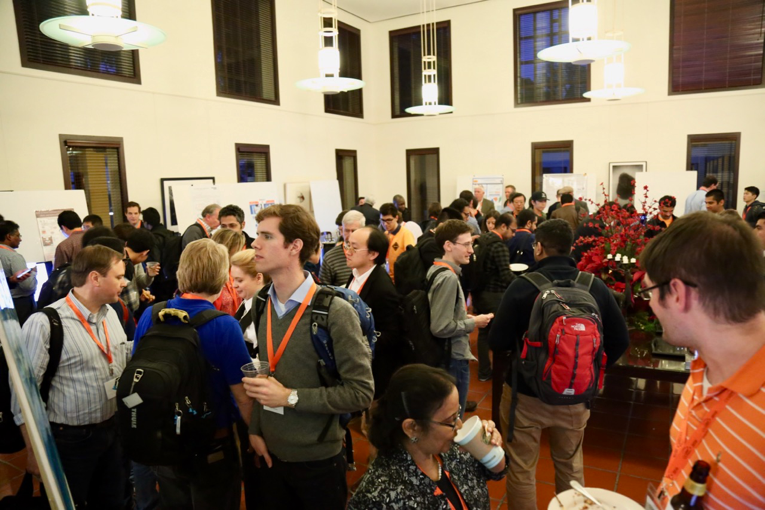 48 groups presented their research to NICE and CoNEXT participants in the evening demo and poster session. The GENI NICE agenda included a panel on “What’s next for SDX research” organized by Russ Clark (Georgia Tech); a session on “Non-IP Experiments over GENI” organized by Nirmala Shenoy (RIT) and Abraham Matta (Boston University); and a session on “Applications and Services using the GENI Wireless Ecosystem” organized by Ivan Seskar (Rutgers University) and Abhimanyu Gosain (GENI Project Office). Thanks to Abraham Matta (Boston University) and Violet Syrotiuk (Arizona State University) for pulling together the technical program, and to the organizers of CoNEXT for ensuring GENI NICE needs for space, networking and audio-visual equipment were met. For more information on GENI NICE 2016, see http://www.geni.net/nice2016. A GENI Regional Workshop (GRW) was hosted by Kuang-Ching Wang of Clemson University. The one and a half day workshop was held on Friday December 2 and Saturday December 3. Attendees included 35 students, 4 faculty and a testbed administrator. Friday morning of the GRW featured two keynote talks: Michael Reiter of the University of North Carolina at Chapel Hill spoke on how Project Silver is addressing security in cloud computing infrastructures, and James Griffieon of the University of Kentucky described an OpenFlow based Science DMZ deployed on his campus. The attendees also heard from K-C Wang on how GENI transformed wired and wireless research projects led by him and others at Clemson by providing an infrastructure for exploration and validation by experimentation. 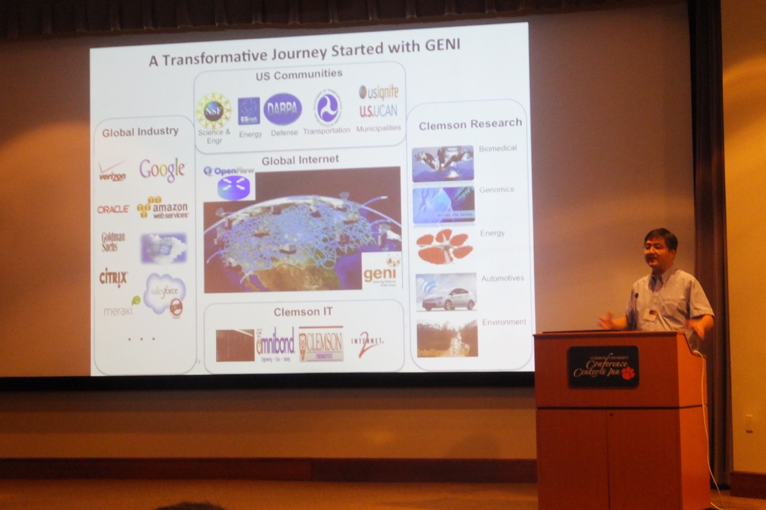 K-C Wang of Clemson University describes how his research was transformed by the GENI infrastructure. The Friday afternoon and Saturday morning sessions consisted of two tracks with hands-on tutorials on Getting Started with GENI, CloudLab, Hadoop, OpenFlow, Network Function Virtualization, GENI Wireless and MobilityFirst. Attendees were free to go between tracks and attend tutorials that matched their interests. Many thanks to Prof. K-C Wang for hosting this GRW at short notice; to Violet Syrotiuk (Arizona State University), Linh Ngo (Clemson University), Geddings Barrineau (Clemson University), Ivan Seskar (Rutgers University) and Abraham Matta (Boston University) for leading tutorials; and Violet Syrotiuk and Abraham Matta for helping organize the event. For more information on this GRW and for copies of presentations made at the workshop, see the workshop page.